Inadequate filtration, forgotten building material, insects, dust deposits and moisture combine to grow bacteria and mould. Our inspection process defines the ductwork's buildup of these contaminants. To facilitate the inspection process we use our patented remote controlled robot BANDY II, complete with mounted video camera, specifically designed to drive through the air distribution system. BANDY II, provides detailed scanning information of the inside air distribution system. This information is projected onto a high resolution LCD monitor and recorded on digital format. During the inspection process we collect particulate samples from the duct interior to provide you with a complete laboratory analysis of the particulate content to identify hazards such as asbestos. Microbial samples are also taken to evaluate the duct surface for bacteria and mould growth. We also inspect the safety equipment (eg. Fire doors). Deficiencies are identified, photographed and recorded. Upon completion of the evaluation, a documented report is presented. The report contains a complete analysis of the findings including a video presentation of the inspected ductwork. Acoustic lined ductwork will be cleaned with our robotic tracked vehicle, BANDY, equipped with an apparatus which enables removal of the particulate accumulation without damaging the acoustic lining. The robot is camera-equipped which enables 100% observation during the cleaning process in addition to future documentation. Further the robot controls provide varying degrees of agitation that protect the acoustic lining from damage during cleaning. Metallic ductwork will be cleaned employing robotic direct contact brushing. The sanitizing of the ductwork employs a proprietary set of motorized brushes that are designed to operate and fit within the size and conditions of the ductwork. Robotics will be used to provide access to the ventilation at all existing outlets to minimize damage to the mechanical integrity of the ventilation system. These brushes will contact the ductwork on all four sides simultaneously, providing a work method that ensures particulate removal of a quality superior to traditional compressed air and hand vacuuming. These brushes render the interior surface of ductwork to its original clean, smooth condition. In addition, specialized robotic tracked vehicles will be used to provide video scanning and direct contact cleaning where applicable. Both pressurized and cellular foam gaskets will be employed in the supply ductwork during cleaning to ensure the loosened particulate is directed to the HEPA filtration units and not allowed to enter the workplace. As a secondary safety precaution in specialized areas eg. CSR, OR sterilized sheets are used as drop clothes over instrument storage and preparation areas. A proprietary HEPA filtered vacuum air handling machine will be employed to exhaust contaminants from the ductwork as they are removed from the ductwork surfaces by robotic direct contact brushes and robots. The noise factor associated with this process has been acceptable to all our customers. All vacuum units will utilize high efficiency absolute filters which contain the particles (HEPA). All particulate captured by the HEPA filtration units will be contained and disposed of at an approved site. ■ Supply and exhaust air fans will be vacuumed utilizing HEPA filtrated vacuum equipment. ■ Fans and fan housings will be cleaned utilizing HEPA filtrated vacuum equipment. ■ Filter trays and housings will be vacuumed utilizing HEPA filtrated vacuum equipment. ■ Mixing plenums will be vacuumed utilizing HEPA filtrated vacuum equipment. ■ Heating and cooling coils will be vacuumed utilizing HEPA filtrated vacuum equipment. ■ All vacuuming and cleaning will be performed with HEPA filtered vacuum equipment. Improper fit and air leakage associated with equipment mounting will be identified and reported. ■ Fusible links will be identified and replaced as required. ■ All ventilation diffusers will be cleaned utilizing HEPA filtrated vacuum equipment. ■ Robotics will be used to provide access to the ventilation at all existing outlets to minimize damage to the mechanical integrity of the ventilation systems. A metal plate, as specified, will be provided to cover all entry points into the ventilation systems. ■ Reheat coils will be cleaned utilizing HEPA filtrated vacuum equipment, high pressure air and coil combs. A metal plate, as specified, will be installed on both sides of all reheat coils as required for cleaning and future inspection. ■ Typically a visual inspection is used to confirm the cleanliness of the reheat coils. This is performed utilizing a back light approach, by placing a light source on one side of the coil and viewing the coil fins from the other. Should you require, the pressure differential before and after cleaning can be measured. If available this can be compared to the original coil manufacturers' design pressure drop. Airflow after the coil can be affected by fan output and overall system balancing. These parameters are usually dictated by a total ventilation balancing project. ■ Air intake louvre and screen vacuumed utilizing HEPA filtrated vacuum equipment as required. To meet the needs of future ventilation hygiene in commercial facilities, and the future direction of government legislation, many of our clients now have a pro-active system to monitor their ventilation. Although there are no official standards yet in Canada, management due-diligence has necessitated a new awareness for the conditions inside the building's ventilation systems. We are often asked about the scope of work for ventilation inspection and monitoring. The parameters of a typical ventilation monitoring program follows. The VENTCARE INC. ventilation monitoring (Early Warning System) is installed on the supply ductwork. The monitoring system is established by installing particulate collectors to the supply ductwork exterior. This involves semi-annual sampling of particulate from the ventilation system to identify the degree of particulate accumulation, hazardous substances (acoustic lining deterioration) and to ensure the filtration on the ventilation system is maintained. VENTCARE INC. will maintain the monitoring system and provide semi-annual changing of the particulate collectors. Upon the anniversary date of the installation, a video inspection at discreet points with our patented robot BANDY II, and microbial sampling (bacteria and mould) will be performed to confirm the integrity of the filtration system. Samples will be taken from the internal surfaces of the mechanical units and ventilation ducts. The microbiological samples are obtained with (Rodac) agar plates for subsequent incubation and examination. ■ An annual video inspection of the main fan systems and a complete review of the fan units, filtration, gasketing, and fresh air intake. ■ Semi-annual changing of the monitors to identify particulate type, size and accumulation. ■ Microbial growth review for bacteria and mould on each of the systems. ■ CO2 testing will be performed to confirm indoor air quality meets federal indoor air quality level. A mechanical inspection of the ventilation filtration components is also performed. ■ Identification legend for all points in the system that were examined and notes describing the method of examination or testing used. ■ Where samples were obtained and type of analysis used. ■ Copy of scale chart showing scaling criteria. ■ Results of analysis for all samples complete with corresponding scale rating. ■ Comments complete with photos, illustrating each sampling location and other observed features of the system. ■ Digitally formatted video showing all areas tested for particulate analysis or microbial growth evaluation, all areas of special interest and general representative sections of the duct and components. To date, of the thousands of fire doors inspected approximately 30% are not humanly accessible from traditional ceiling access points. Our patented robot overcomes this obstacle, allowing complete documentation of all fire doors within the ventilation system. Further, of the total, approximately 7% have been found defective, blocked with wood, wired up, or simply closed shutting off airflow. 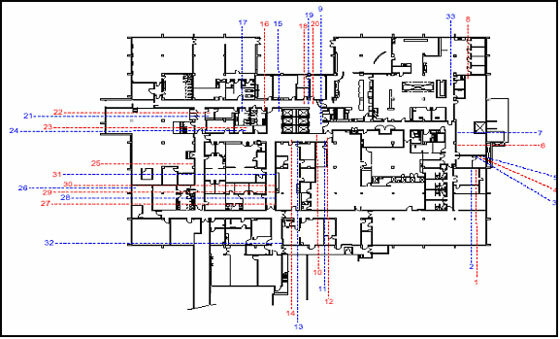 This is a sample of the digital image which is provided in CD format for fire door location and status. 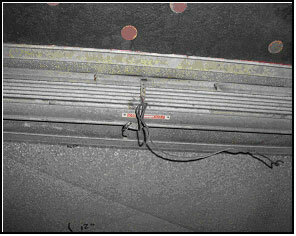 The FIRE DOOR was found to be defective, it is held up by wire.